With a title like Birthdays the Beginning, I didn't know what to expect from this game when I booted it up. Knowing it came from the creator of Harvest Moon, Mr. Yasuhiro Wada, I was expecting something along those lines. What I got, was something a bit different. Birthdays the Beginning is a new PS4 game where you have the ability to shift the terrain of an entire world around to change temperatures and the environment as a whole. Your actions have far reaching consequences on the life (or death) of creatures within that world. So, is this game the perfect birthday present, or is this all-powerful god-game a bit of a party pooper? Let's find out! I honestly didn't expect Birthdays the Beginning to have a story mode, but here we are. It's actually not too bad either! You play as a person who discovers a map within their grandfather's vast collection of books. This map leads to a cave in the local forest, one that transports you to another world. Here you meet a powerful deity named Navi who needs your help bringing life and civilization back to a barren landscape. The story is broken up into episodes, each of which offer a small glimpse into the events unfolding around you. It's not going to change your life, but as I've often said, stories in these kinds of games are a welcome addition, but not a requirement for a good time. In this case, I liked having a framing device for what I was doing. Also, despite the fact that Navi's voice can grate on the senses (like another Navi we know from a certain game about a boy whose name rhymes with Link), it was nice having tips and tutorials in place to help me understand the games complexities. So, right out of the gate we have a pleasant surprise in the form of a well-structured story mode that gives us a simple, but serviceable framing device to work with. It's time to look at the gameplay. At first, I was overwhelmed by Birthdays the Beginning. I've played plenty of games like it, but this one betrayed me with its cutesy art style and colorful graphics. I wrongfully assumed it would be simple, but it is more certainly not simplistic. In the game, you have the ability to fly into the world and raise or lower the terrain to your heart's content. Going below sea level creates water, and going high up creates snowy environments. Depending on how many levels you go up or down, you'll also change the classification of the land. For example, a -1 tile is considered "shallows," but going deeper below sea level creates a "deep sea" area. Furthermore, adding large quantities of water raises the overall temperature of the world, while adding higher regions of land lowers it. All of these things are told to you while you're manipulating, but the actual consequences of your actions can't be seen until you let a lot of time pass by. Thankfully, as you run out of energy (here known as HP), you can leave the world and resume time. Your HP quickly recharges and you can expend some of it to fast forward hundreds or even millions of years into the future. Watching time fly by can be both exhilarating and terrifying. In high speed mode, creatures will be born (known as Birthdays in the game), and will die out based on our changes. Things like overall temperature changes pretty quick, but water temperature is a much slower process. In the beginning, I was frustrated because I didn't realize this (it's told to you, and you can see it in the Game Info section of the pause menu), and I couldn't get the water where I needed it to progress the story. Now, items spawn that can be used to speed things up, but the process, more often than not, will be a slow and deliberate one. For me, this wasn't an issue, but I could see some gamers becoming bored waiting on the next big step. Patience is a virtue, both in life, and in Birthdays the Beginning. Let time pass, and trust in your instincts. You'll find that, soon enough, that creature you're trying to create will find its way into existence. There are hundreds of creatures in Birthdays the Beginning, all of which are based on actual organisms (both alive and extinct). Moving up through the evolutionary chain from plankton to dinosaurs, and beyond, is really exciting once you get into it. I won't see here and claim that Birthdays the Beginning is for everyone, but if you give it a chance, there's a very addictive world simulator hidden here. Trying to create all of the possible creatures offers huge gameplay value, and a free mode becomes accessible after you've finished the first chapter of the story. The only faults I can find with Birthdays the Beginning are few and far between. I would have liked a little more options for manipulating the world, like being able to manipulate weather patterns or directly influence the world in other ways beyond terrain manipulation. You have the ability to scan and catalog new creatures that appear in your world, which is really cool for collecting records on all of them, but even with things like minimap modes for creatures only and a first-person mode, it's often hard to find new creatures so you can scan them. I would have also liked the opportunity to reset story episodes in case my world went out of whack. Instead, I was forced to make environmental changes and turn back the clock through my actions, which is both cool and frustrating in equal measure. I had some small issues with the camera as well. When you're near a tall structure or a deep ocean, you'll get pulled towards the top or bottom respectively and it can cause the camera to clip into the world or swing out of view until you rip free. It makes complex manipulation a little difficult when you're constantly getting control ripped away as you approach some of your more impressive changes to the world. The first person view mode can also be problematic. While there's an option to move horizontally, the fact that you clip through the environment and into a lava-filled center of the world, makes it hard to precisely approach areas in your world. I almost would have preferred hitting solid objects instead of always passing through them. Control and camera frustrations aside, I really did have a fun, relaxing time with Birthdays the Beginning. Let's see how it all presents itself. 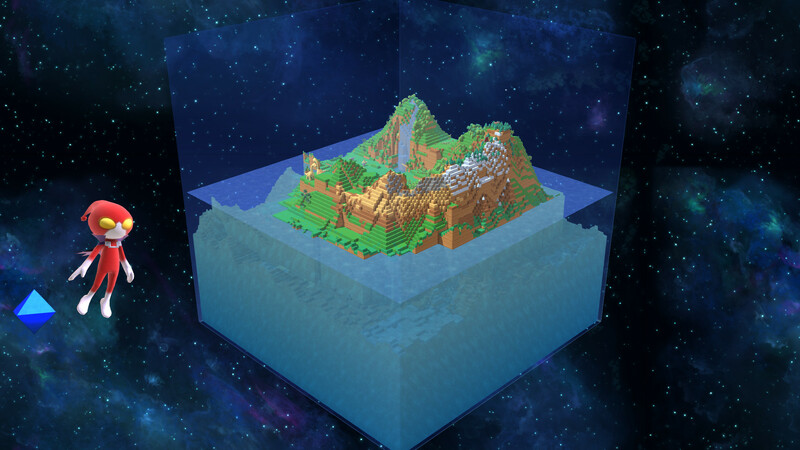 Birthdays the Beginning is a wonderful looking game. It has a colorful and vibrant art style that makes it look like a simple game. While it's not simple at all, it is most certainly a game that all ages can enjoy. If you have kids, you can play it with them and help them understand how some of the mechanics work. Even if they just want to create huge mountains and rivers, they can do that too. The creatures do roam around and eat, but there's no violent tussles or questionable content of any kind. 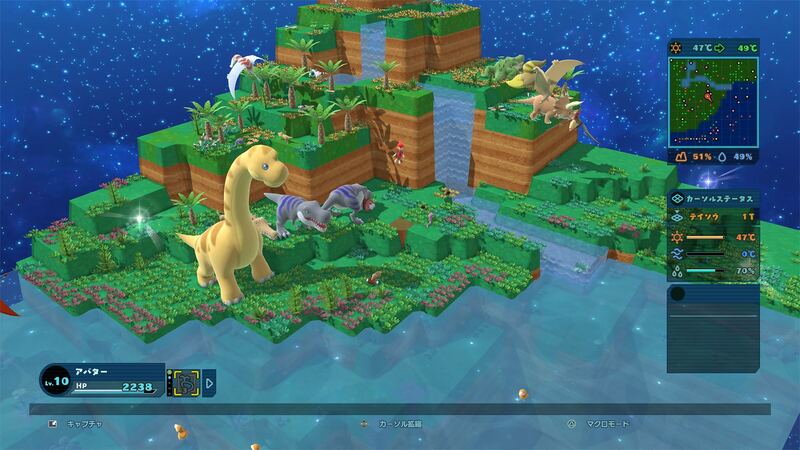 Birthdays the Beginning is just a nice, wholesome, surprisingly deep simulation game that caters to a wide variety of gamers within that genre. While it may have been overwhelming at first, I soon found myself swept up in the processes of Birthdays the Beginning. It's terrain shifting and instant gratification in the form of "birthdays" soon roped me in and I found myself playing for hours. It's not perfect, and it can be frustrating at times with camera issues, but overall, I enjoyed my time with Birthdays the Beginning, and I plan on returning to it very soon.